It's only 3 weeks until the 20th annual ISGB Gathering in Bellevue, Washington. The International Society of Glass Beadmakers will converge on the Hyatt Regency from July 26-29, 2012. I can't wait!! 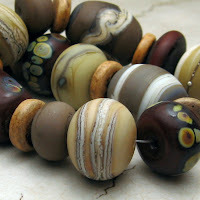 I am getting more beads made for the Bead Bazaar on Saturday, which is open to the public for only $5.00. See the top lampwork artists in the world displaying the best work.